Last year’s demanding winter, combined with mine repairs, labour shortages, and an ice storm in late spring, resulted in a shortage of bulk salt. As predicted, the mines’ obligations to municipalities have posed a challenge by reducing or eliminating salt allocations to private contractors. For over 25 years, Draglam Salt has been working tirelessly to supply contractors with the bulk salt and deicers they need to keep people safe. Despite this season’s unique challenges, we currently have the most bulk salt supply in the private contractor market at the most competitive pick up price. As we continue to bring in deicing salt from alternative sources, logistics and transportation costs continue to rise. We encourage you to pick up and store as much bulk salt as your facilities allow. This will ensure you are well supplied if the price increases and/or supply diminishes. We are committed to navigating this challenging season ahead and look forward to being your supplier of choice for bulk salt, bagged salt and environmentally-friendly deicers. We’re excited to share that Toronto Redimix has undergone an entirely new look. Following the rebranding of our parent company, G&L, updating of the logo created almost 15 years has given Toronto Redimix a fresh new look. Each of G&L’s sub-brands was assigned its own key brand colour, drawing upon the natural elements that inspire the products. Toronto Redimix is red, to ensure consistency and recognition. These colours help to easily identify the brand at a glance, and carve out a more distinct brand presence. Furthering this was the creation of each sub-brand’s individual icon, based upon G&L’s legacy round logo, but modernized to convey each brand’s unique product offering. Toronto Redimix’s icon is made of oblong, ovulary circles representing the exposed aggregate found in concrete. The icons serve as another method to unify all brands under the G&L umbrella while creating a unique pattern distinct to each sub-brand. Our goal with this rebranding was to create something enduring that would appear contemporary today, yet be timeless enough to last throughout the next decade. We’re extremely happy with the result and look forward to rolling out our new look. We’re excited to share that Draglam Waste & Recycling has undergone an entirely new look. Following the rebranding of our parent company, G&L, updating of the logo created almost 15 years has given Draglam Waste & Recycling a fresh new look. Each of G&L’s sub-brands was assigned its own key brand colour, drawing upon the natural elements that inspire the products. Draglam Waste & Recycling is navy – a key colour in the former Draglam logo. These colours help to easily identify the brand at a glance, and carve out a more distinct brand presence. Furthering this was the creation of each sub-brand’s individual icon, based upon G&L’s legacy round logo, but modernized to convey each brand’s unique product offering. Draglam Waste & Recycling’s icon is made of triangles, the international recycling symbol. The icons serve as another method to unify all brands under the G&L umbrella while creating a unique pattern distinct to each sub-brand. Our goal with this rebranding was to create something enduring that would appear contemporary today, yet be timeless enough to last throughout the next decade. We’re extremely happy with the result and look forward to rolling out our new look. We’re excited to share that Draglam Salt has undergone an entirely new look. Following the rebranding of our parent company, G&L, updating of the logo created almost 15 years has given Draglam Salt a fresh new look. Each of G&L’s sub-brands was assigned its own key brand colour, drawing upon the natural elements that inspire the products. Draglam Salt is light blue, representing winter. These colours help to easily identify the brand at a glance, and carve out a more distinct brand presence. Furthering this was the creation of each sub-brand’s individual icon, based upon G&L’s legacy round logo, but modernized to convey each brand’s unique product offering. Draglam Salt’s icon is made of small squares to convey the cube structure of rock salt when seen under a microscope. The icons serve as another method to unify all brands under the G&L umbrella while creating a unique pattern distinct to each sub-brand. Our goal with this rebranding was to create something enduring that would appear contemporary today, yet be timeless enough to last throughout the next decade. We’re extremely happy with the result and look forward to rolling out our new look. We’re excited to share that Earthco Soil Mixtures has undergone an entirely new look. Following the rebranding of our parent company, G&L, updating of the logo created almost 15 years has given Earthco Soil Mixtures a fresh new look. Each of G&L’s sub-brands was assigned its own key brand colour, drawing upon the natural elements that inspire the products. Earthco Soil Mixtures is green, representing plants and trees. These colours help to easily identify the brand at a glance, and carve out a more distinct brand presence. Furthering this was the creation of each sub-brand’s individual icon, based upon G&L’s legacy round logo, but modernized to convey each brand’s unique product offering. Earthco Soil Mixtures’ icon is made of circular shapes reminiscent of soil particles. The icons serve as another method to unify all brands under the G&L umbrella while creating a unique pattern distinct to each sub-brand. Our goal with this rebranding was to create something enduring that would appear contemporary today, yet be timeless enough to last throughout the next decade. We’re extremely happy with the result and look forward to rolling out our new look. We’re excited to share that Brock Aggregates has undergone an entirely new look. Following the rebranding of our parent company, G&L, updating of the logo created almost 15 years has given Brock Aggregates a fresh new look. Each of G&L’s sub-brands was assigned its own key brand colour, drawing upon the natural elements that inspire the products. Brock Aggregates is grey, representing stone and gravel. These colours help to easily identify the brand at a glance, and carve out a more distinct brand presence. Furthering this was the creation of each sub-brand’s individual icon, based upon G&L’s legacy round logo, but modernized to convey each brand’s unique product offering. Brock Aggregates’ icon is made of sharp, geometric shapes reminiscent of crushed stone. The icons serve as another method to unify all brands under the G&L umbrella while creating a unique pattern distinct to each sub-brand. Our goal with this rebranding was to create something enduring that would appear contemporary today, yet be timeless enough to last throughout the next decade. We’re extremely happy with the result and look forward to rolling out our new look. Updating the logo created almost 15 years ago and bringing it into the modern day, the wordmark was refined, making it more contemporary while preserving elements of the brand’s legacy. Choosing navy blue as the primary G&L colour, brand traits like confidence, strength and stability are conveyed, and its combination with pristine white makes marketing material appear simple, crisp, and clear. Using “Driven” as the powerful new brand campaign message, this notion drives (pun intended) all the creative, from the visual choices made to the headlines. Headlines specific to the sub-brand, such as “Driven to Keep Roads Clear and People Safe”, and “Driven to Build a Solid Foundation” – boldly state the mission of the sub-brand while maintaining the unified G&L message. Key photography used throughout marketing material is centered around motion. Showcasing movement in both vehicles and people, speed, power, and forward momentum are visually conveyed. These striking images combined with arresting colours and powerful headlines form a compelling new direction for G&L – one that makes the brand stand apart. The salt supply shortage has persisted and we are continuing to source bulk salt from alternative suppliers. We anticipate this season to be busier than normal, so we’re taking extra steps to speed up wait times at our scale houses. New for the 2018/2019 season, it will be mandatory for all pick-up customers to present their Salt Card™ at the scale house in order to pick up salt. To ensure that we prioritize our loyal customers this upcoming season, only customers who present a Salt Card™ will be served. - Never leave salt in your salter. - Wash your salter more often throughout the winter to keep the salt from building up. If you need a Salt Card™ or have questions about your salt supply this season, contact your Account Manager or call 416.798.7050. We are excited to announce our newest location in Orangeville! Located just south of Hockley Road and 5th Side Road at 673271 Hurontario Street, this newly acquired pit will produce A Gravel, B Gravel, Concrete Sand and ¾ Round Gravel. We look forward to servicing your projects throughout the GTA with this close-to-market aggregate source. •	Last season was a demanding winter. Precipitation was consistent throughout the winter and an unexpected ice storm in April spanned several days which depleted most stockpiles throughout North America. •	A labour dispute at one salt mine led to a 3-month strike. This labour shortage has undoubtedly affected the amount of salt allocated to the landscape and commercial markets. •	Another mine is undergoing significant repairs, leading to production delays which affect the supply available to our commercial market. •	The US market is contributing to Canadian supply issues due to the strong American dollar which is directing supply away from the Southern Ontario market. •	Draglam Salt has taken every effort to secure salt for this coming season. However, salt from unconventional sources inevitably comes at a higher cost. We are doing our best to find efficiencies and have been working throughout the summer to secure supply. For another perspective on the salt shortage, visit https://horttrades.com/salt-inventory-shortage-prepare-yourself-and-your-customers. At Draglam Salt, we know that salt is essential to ensure safety, and we take our responsibility seriously. We encourage you to pass on this update to your customers and communicate with them regularly to ensure they are aware of the situation. We are committed to navigating this challenging season ahead with the support of our suppliers and customers. In the coming weeks, you’ll find out more about the status of the market supply, the look and feel of rock salt from all over the world, and the prices you need to secure contracts. We look forward to partnering with you to conquer Winter 2019. 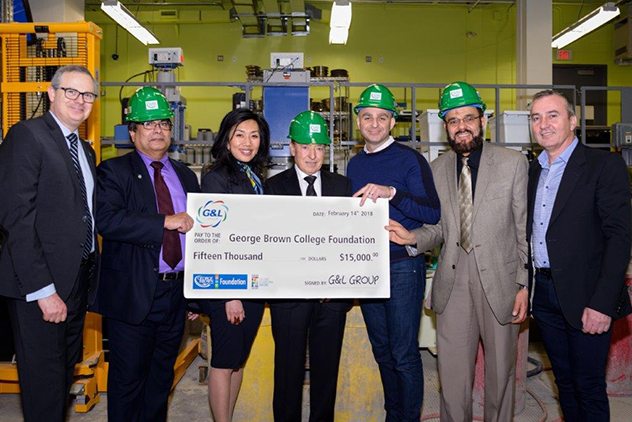 On February 14th, G&L Group proudly presented George Brown College with a cheque for $15,000 in support of Construction & Engineering Technologies. Faculty and staff of George Brown joined with members of G&L Group to celebrate this donation made in honour of Joe Lamanna, G&L Group's Founder and President of Aggregates. At the cheque presentation event, Pat Lamanna, President of Salt, Soil and Waste, and son of Joe Lamanna, President of Aggregates, noted the importance of supporting dedicated and passionate workers in the construction sector. "For the last 47 years, I have seen my mom and dad work tirelessly to create and build G&L Group. My dad would start at 5 a.m. and work until 10 p.m., six days a week. His dedication to my family, our customers and over 250 employees is evident in all of the work he does. We want to recognize students who share similar values as my dad. We hope to encourage students to continue working hard so that they can give back to our community in the same way, one day." The G&L Group Scholarship Award in Honour of Joe Lamanna will be awarded to two full-time students each year for the next three years. Each student will receive a $2,500 scholarship. G&L Group was proud to be the 2018 Presenting Sponsor at the Landscape Ontario Awards of Excellence, an annual juried competition that celebrates achievement in construction, maintenance, and design in the landscape industry. This year’s awards took place on January 9th with a Miami beach nightlife theme dubbed “The Heat Is On”. 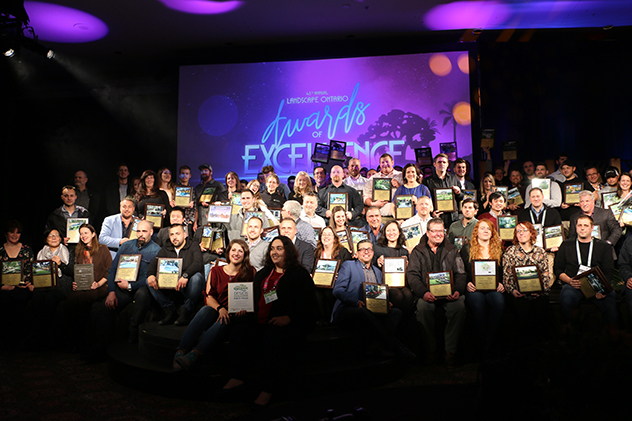 Recognizing great work and serving to inspire, the Landscape Ontario Awards of Excellence also stir the competitive spirit and stimulate advancement, achievement and improvement, raising the bar for the industry. With Frank “Frankie Flowers” Ferragine as master of ceremonies, it was a fun-filled evening. G&L Group held a social media contest at the event, giving away a trip for two to Miami. Congratulations to the winner, Evan Kalentzis of Royal Stone Group!